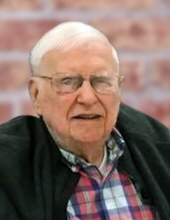 Eric Paul Selin, 95, of Rockford, IL passed away on January 27, 2019 at his residence at Wesley Willows. He was formally a resident of Davis, IL; Elgin, IL; and Champaign, IL. Eric was born on October 24, 1923 in Orebro, Sweden to Paul David Selin and Ruth Elisabeth Olsson Selin. At the age of three he emigrated to the United States with his three older siblings and parents on board the M.S. Gripsholm. The family settled in Champaign, IL where Eric became a citizen of the U.S. at age nine and graduated from Champaign High School in 1941. After graduation he was called up to serve in the Seventh Army as a rifleman in the infantry. He was asked to serve as a clerk typist for ‘in the field court martials’ and moved up to regular courtrooms as a court reporter for the rest of the war. On the day they needed a clerk typist they asked for someone who could type and spell. He was glad his dad had encouraged him to take a typing course while he waited for boot camp. He served in four campaigns: the Sicilian, Rome, Northern Appennines, and African Middle Eastern. Eric was honorably discharged on November 24, 1945. Upon arriving home from the war, he took advantage of the new GI Bill and enrolled in the University of Illinois. Eric married June A. Hubbard on August 3, 1946. In 1949 Eric graduated from the University of Illinois College of Media and was a Bronze Tablet recipient. Eric and June had three children. In 1958 Eric was one of the young executives picked through an aptitude test to begin training on learning to program IBM computers. He would continue working with computers, programming, and managing Information Technology through the two companies he worked for: Jewel Tea Company and First National Bank of Chicago. In retirement he also prepared taxes for people using his laptop until the age of 88. Eric married Evelyn Whetsel on July 11, 1996. Eric enjoyed playing chess with masters and novices alike and belonged to many chess clubs through the mail where some of his favorite opponents were prisoners who also enjoyed chess. He was a great reader and was reading his newspaper every day and books until the day he died. He loved watching his children and grandchildren participate in sporting and music events. He was an avid eater and was thoroughly spoiled by both of his wives excellent cooking. Eric was preceded in death by his parents Paul and Ruth and all three of his siblings Hans, Fritz and Margaret. He was preceded in death by both of his wives, June (1994) and Evelyn (2017). He is survived by his children Eric H. Selin (Elgin), Debra Samuelson (Orangeville) and Jo Kneitz (Elgin). He is also survived by many step children and step grandchildren and stepdaughter Jennifer Bunjes of Rockford. He is also survived by five grandchildren Eric J. Selin (Elgin), Jared W. Samuelson - Harmoni (Hamburg, Germany), Jessie Mills - Alex (Orangeville), Hank Kneitz (Washington, DC), and Sherry Kneitz (Chicago). He is also survived by great grandchildren John and Samantha Mills and Violet Samuelson. Memorials may be given in Eric’s name to the American Legion at www.legion.org. Cremation rites accorded with private interment at Grandview Memorial Gardens in Champaign, IL. "Email Address" would like to share the life celebration of Eric Paul Selin. Click on the "link" to go to share a favorite memory or leave a condolence message for the family.